The word 'Ju Jitsu' literally means 'soft method' or 'art of softness'. Soft refers to the evading, diverting philosophy of Ju Jitsu. It is written using these two Japanese symbols: . It is pronounced as: [dʒu: dʒitsu:]. There are several other written forms like ju-jitsu, ju jutsu, jiu-jitsu, dzsiudzsicu (Hungarian phonetical). 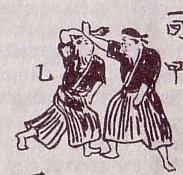 It is a collection of several hundred years old Far East, mainly Japanese self-defense and attack grapplings, armed and unarmed techniques. 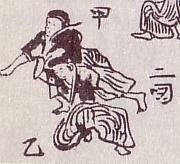 Ju jitsu evolved among the samurai and the unarmed farmers, commoners of feudal Japan as a method for defeating an armed and armored opponent with or without weapons. The Hungarian Ju Jitsu Association has been official spelling it 'Ju Jitsu' since 2009. As a matter of course, citations of earlier sources use the original form. 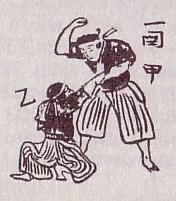 The use of weapons beside the unarmed trainings is really sophisticated the grappling-techniques. In ju-jitsu you come to know your limits, thought twice before trying to disarm a soldier who bare a sword or spear, unless your life were in danger and lack of withstanding an attack eventually would have lead to death. This is where -among other things- differencies can be found in Ju-jitsu compared to modern Budo self-defense styles. Ju-Jitsu is about keep looking for the right path, it is an open system, which constantly adapts to the ever changing human body culture. It tries to utilize the modern age's new scientific knowledge, achievements, and not necesserelly insists using old-tradicional ways, techniques. Nowadays Ju Jitsu is a highly effective method of self-defense used all across the world. The offensive and close combat techniques are first of all used by representatives of armed forces. The modern Ju Jitsu is an organic part of the trainings of the law enforcement bodies in many countries. As modern western military training comes into use in Hungary, prospectively the role of Ju Jitsu is going to grow in military hand-to-hand combat as well as in civil self-defense. Our syllabus (collection of techniques) is based on the world federation's (WJJKO) curriculum. The members of Hungarian Ju Jitsu Association can take belt exams based on this syllabus. What gives us Ju Jitsu? Like every sport, it helps maintain our fitness, improves our physical condition to become more flexible, agile and stamina. Practicing of fighting conflicts, it helps to get rid of the agression inside us, creating a healthy self-confidence with better morality in our souls. It is an effective self-defense which could help us to protect ourselves, our family and valuables. It requires precise and persistent work, however it's effects are easily seen. For many of our students this training is the first example for a long-term planned and measured work and effort. Everybody is able to learn Ju Jitsu even without special physical condition, the only thing it requires from the person is commitment.